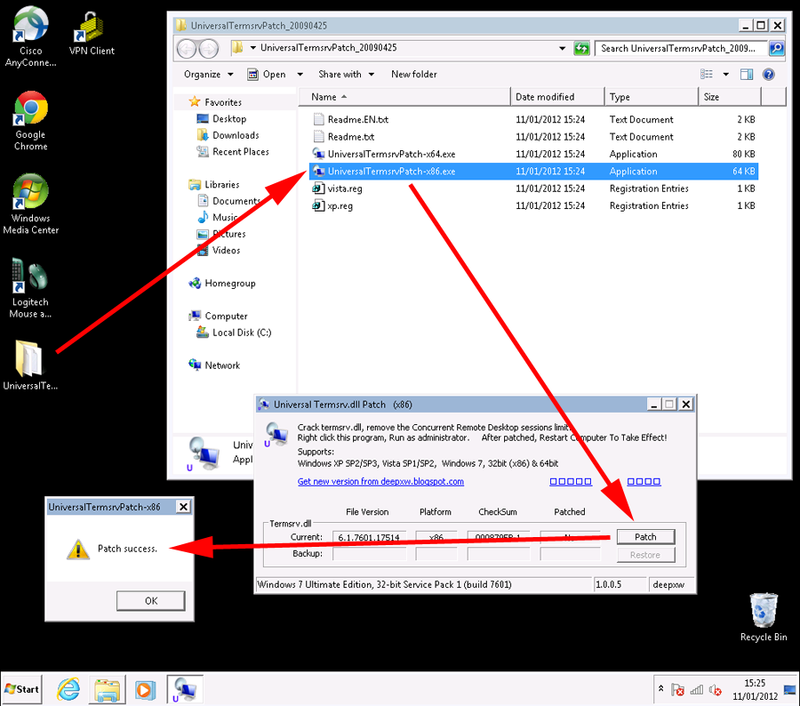 If you have Windows 7 (Professional, Enterprise or ultimate) you can already connect to it remotely using RDP. Unlike Windows Server 2008/2003/2000 which can have two concurrent RDP connections for remote administration, Windows client operating systems can only have one. If someone is logged into the machine and you connect in, it simply kicks them out to the login page. This was never a problem for me until I set up a tiny Acer Revo PC behind my TV to use as a media server. If anyone was at home using the media server and I remotely connected to it (I do this quite often to check client VPN’s and to check websites are up and firewalls I’m working on are configured correctly). 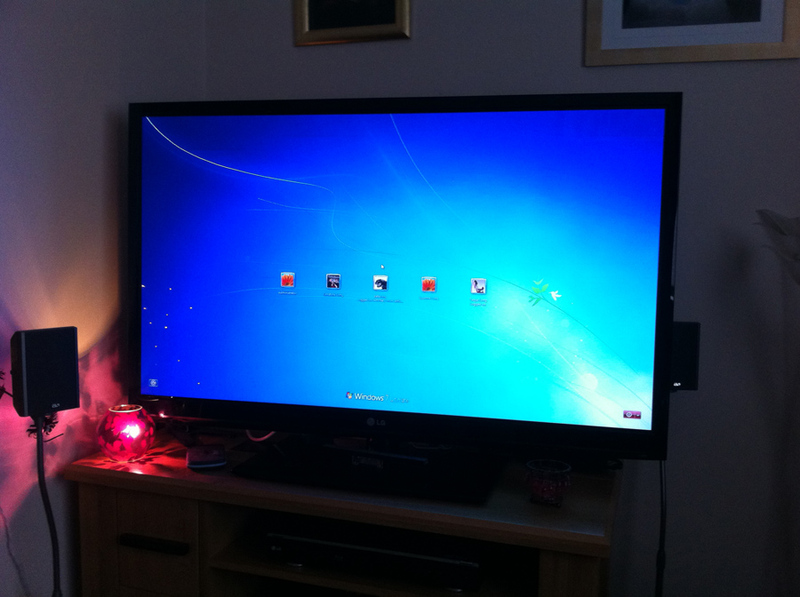 The TV screen would fill with the Windows 7 Login screen. 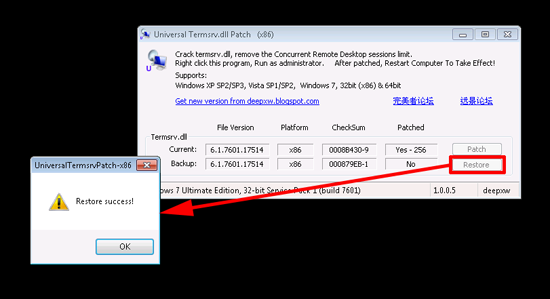 To get round this problem you need to “Patch” a particular windows file called Termsrv.dll. Thankfully over at deepxw they have done the hard work for you, and created an installer that backs up your termsrv.dll file, then patches it. 1. Download the patch (UniversalTermsrvPatch_2) and extract it to your desktop. 2. Locate the installer for either x32 (x86) or x64 bit versions of Windows depending on which you have. If you’re unsure click here. Click “Patch” and it should say that it was successful. 3. Reboot the client machine. Simply re-run the installer agin and select “Restore”. Then reboot.